On the line of DO-The-New, Tata Docomo, India’s youngest and fastest growing GSM mobile service operator today introduced another innovative product dubbed as “Daily Plans”. 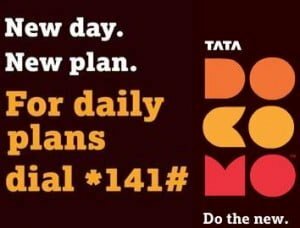 The all new product which is specially designed to provide more flexibility over prepaid tariff and also aims to cater every one with their own needs.With the new products Tata Docomo GSM prepaid subscribers can buy new tariff plans/ Minutes as they need on Daily basis. To avail the Daily Plans, subscriber can just dial *141# from their mobile and choose from a host of daily plans of local, STD, Night Calling , GPRS and music.The subscribers are also alow to get multiple packs in a day. Daily implies active till 12 midnight on the same day of pack activation. Ex: A subscriber activated the pack on 15th March’10 then the pack with daily validity will expire at midnight of 15th March’10#. In case on night packs the expiry of the pack will be 12 midnight of the next day of activation of the pack. Ex: A subscriber activated the night pack on 15th March’10 then the pack with daily validity will expire at midnight of 15th March’10#. Tata Docomo also clubbed one contest with the Daily Plans which may give you a chance to win couple passes for 40 parties across India at Tata DOCOMO’s Karbonn IPL Nights.